A few years back, we introduced Pick Your Price ticket discounts, which give you the opportunity to shop around for the day and price that suits you best. Last year, we add another option, called 2 Day Flex Tickets. If you’re planning to visit two days in a row, your best bet is still to purchase your Day 1 tickets online. Then during your visit, buy Next Day Tickets at the park for $30 each. 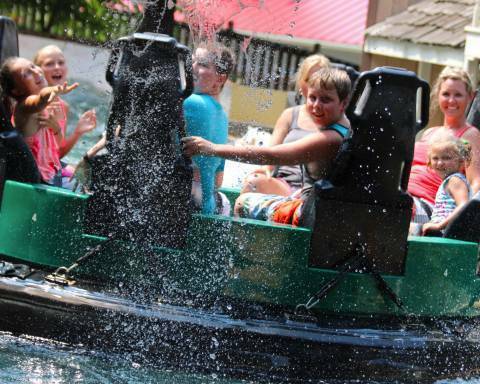 We sure hope this additional option will help you plan your best visit ever to Holiday World & Splashin’ Safari! We love staying at Lake Rudolph Campground ! It’s so convenient to be able to shuttle back and forth from the campground to Holiday World as many times as we want throughout the day – and the campground is so clean ! Are fastpass tickets available to purchase to make wait times shorter? We don’t sell skip-the-line passes, but do have a single-use Front of the Line pass offered as a prize at The Plinko Wall game. You can use a flex ticket two days in a row, though it might be cheaper to purchase a $30 next day ticket on the day of your first visit. Awesome to have more options for all! Thank you!! Holiday World!! I would love the 3day pass and if we win the Icee contest so I can bring my grandchildren and we will eat Icees all 3 days.